Scottish Indoor Rowing League – Round 3 results – We have had another very successful result in the Scottish Indoor Rowing League. 78 pupils participated in this round and 16 managed to achieve national top 5 positions in their age group. In S1, Jasmine Brown came 1st, Isabelle Gallacher 2nd and in joint 3rd place were Becky Wilson and Isabella Wiseman. In S2 Morven MacLean was 1st, Amber Drummond 2nd, Arlene Morrison 3rd and Scarlet Pickering 4th. In S3, Sara Johnston retained the 1st place she has held in all three rounds and Jade Moore came 2nd. With senior pupils back from exam leave, some S4 and S5 pupils were able to participate in this round for the first time. In S4, Eilidh Johnston was 2nd girl and in the boys’ race, Joseph Stewart was 4th while Lewis Powell came 5th. In S5 Syd Tippett was 1st, Mark Warren 2nd and Joe Smith came 3rd. Congratulations to all! Gairloch High is the smallest school participating and yet we have finished in 2nd place overall, only being surpassed by Hillhead High School in Glasgow, which had over 200 pupils taking part. After Round 1 we were in 4th place and in Round 2 we moved up to second. Some of our national indoor rowing champions are pictured here. The after school indoor rowing club will continue next session and we will be training hard to prepare for the Scottish Schools Championships in Glasgow in November. We hope to take a bigger team this year and challenge for individual medals and team trophies once again. Thanks to Mrs Johnston for encouraging the pupils to participate. S1-3 Football Result – Congratulations to the S1-3 Boys’ team who beat Kinlochbervie High School 11-1 on Friday the 5th of June. Scorers were David MacGregor (4), Joel Goldby (2), Calum Copland, Callum MacDonald, Sorley Street, Roddie Wyatt and Matthew MacKenzie. This result rounds off three very successful games in the last three weeks. Thanks to Calum Nelson and Mark Warren for refereeing this game. Sports Day Results 2015 – Cold, rainy, damp and great fun! 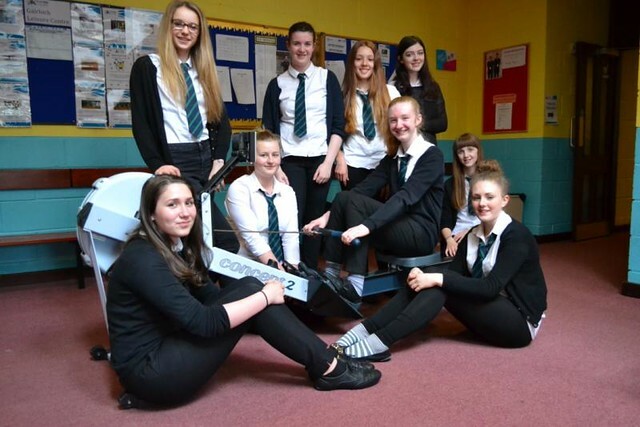 Well done the pupils of Gairloch High School who participated fully in their events. Each pupil gained points for participation in up to four events for the House competition. In addition championship points were awarded to winners. The results were announced at assembly. 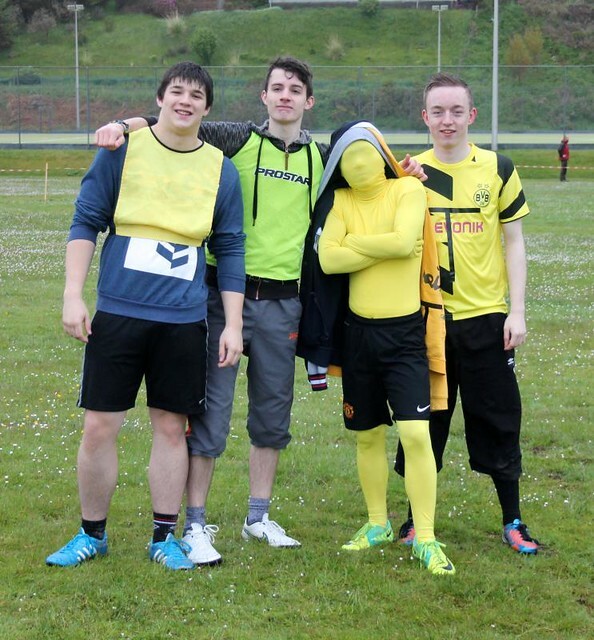 There are lots of the photos on the school website – click on the image of the senior boys from Tollaidh in house colours to see more from the day. Staffing– There are significant staff changes taking place in the school. Ms Leitch retired at Easter. She has served pupils faithfully for many years as a member of the Learning Support Staff. Ms Mackison (PT English) and Mrs Newman (Learning Support) are both retiring this summer. Mr Avenel (French) is currently applying to further his teaching career in another school. Mr Johnston (Biology and PT Pupil Support) has been appointed as the Director of the new Highland Science Skills Academy. This post is a collaboration between the University of the Highlands and Islands and Highlands and Islands Enterprise based in Inverness. The combined years of experience and service provided by these individuals to the pupils of Gairloch High School is greatly appreciated and will be sadly missed. Proper farewells will be made at Prize-giving on Monday 29th June (1.30-3.30pm) to which all parents and relatives are invited. Meanwhile the school community wish each of them health, success and best wishes for the future. We are pleased that Miss Emma Smith will continue in post teaching Geography as a full time member of the teaching staff after competitive interview. Vacancies in Biology and English have been advertised and we hope to announce successful appointments soon. UKMT Junior Maths Challenge – In April, the majority of S1 and S2 took part in the UKMT Junior Maths Challenge, which involves 25 demanding multiple-choice questions. Harry Dalzell, S1 came first with Morven MacLean and Amy Tattersall (both S2) joint second. These three pupils will receive a silver certificate. Also, in S2, Scarlet Pickering and Kai Johnston performed well and will each receive a bronze certificate. Well done to all the pupils who took part. 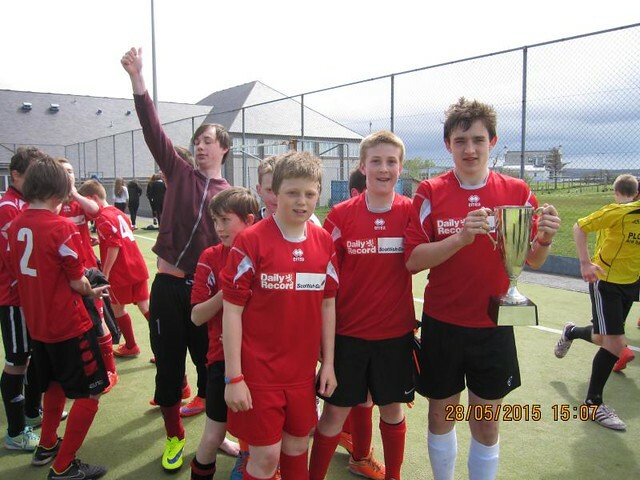 Gairloch High School v Plockton High School: MacPherson Cup – Second Leg – The S1-3 team welcomed Plockton High School to Gairloch on Thursday the 28th of May. Gairloch dominated the first half, scoring the first goal through Chris Adam. The score going into the second half was 1-1 and it wasn’t long before Gairloch were ahead again with another goal from Chris Adam. Gairloch had numerous chances to add to this score, hitting the woodwork on three occasions. Plockton, who were trailing 4-1 on aggregate, raised the level of their game in the closing stages and scored two goals from free kicks. This ensured a nervy end to the game. Despite losing 3-2 on the day, Gairloch retained the MacPherson Cup, winning 4-3 on aggregate. Thanks to Neil MacKenzie for refereeing the game. Click on the photo to see more images. 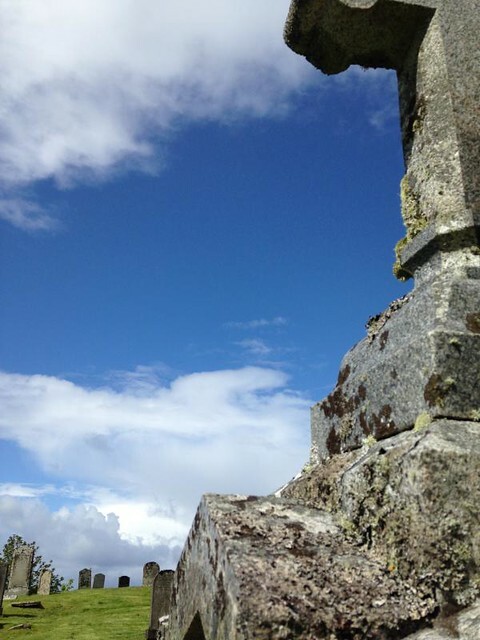 The first leg was held in Plockton on Monday 18th May. After a hard-fought first half with no goals, David MacGregor opened the scoring for us early in the second half followed by a second goal from Joel Goldby – both fine strikes in to the corner of the goal. Plockton rallied and hit the bar twice in the later stages of the game but Gairloch defended well to win 2-0. Primary 7 Pupils – On Thursday 4th and Friday 5th June P7 pupils attended High School for some timetabled classes and activities. They were also introduced to the Den. At the end of day on Friday they watched the last few minutes of the S1-S3 football match against Kinlochbervie before being presented with their school ties. We look forward to welcoming them back as S1 pupils in August. S2 Geographers and the OS – S2 pupils have been refining their map skills and got creative, thinking up new Ordnance Survey map symbols. They have entered a competition run jointly by the BBC’s One Show and the Ordnance Survey which asked the British public to submit suggestions for 10 new map symbols including climbing centres, electric car charging points and even a new symbol for a toilet. The symbols had to be easy to identify and read on a busy map. Entries have now closed and a judge will pick the winning designs to be printed on the 2 million Ordnance Survey maps printed each year! Indoor Rowing Round 2 – After the heady success of our pupils achieving fourth place in Round 1the National Indoor Rowing League last month we were delighted to find out that at the end of Round 2 the school has moved into second place. Only Hillhead High is ahead of us as we row for the third and final round this month. Each pupil who takes part in the competition gains a point with the fast five nationally in each year group receiving additional points. Those were – S1 Boys: 1st Dylan Paterson, 4th George Pickering and 5th Tom Wood. S2 Girls – 1st Scarlet Pickering, 2nd Amber Drummond, 3rd Morven MacLean, 4th Arlene Morrison. S3 boys – 4th Iain Nelson. S3 Girls – Sara Johnston, 2nd Jade Moore, 4th Carys Townsend, 5th Carla Watson. Twelve schools remain in the league from across Scotland so a remarkable standard is being maintained by the girls and boys of Gairloch High. Well done to all! Round 3 results will follow soon. 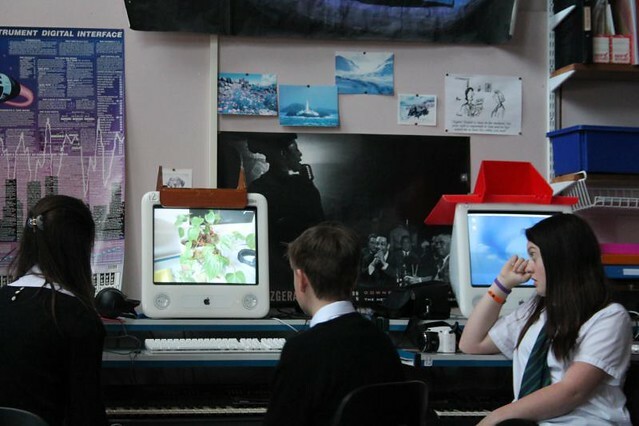 Photography Workshop – Adrian Hollister, from the Perfume Studio, came into school on the 28th of May, to work with pupils in S2 and S3, who are interested in photography. After some instruction and discussion about what makes a good photograph, pupils were set tasks to accomplish in and around the school. When their photographs were downloaded, we discussed what made them good or what could be improved. Pupils then went down to the beach & graveyard to take more shots. After they were downloaded, we all noticed the improvements that pupils had made since the beginning of the day, by taking Adrian’s advice earlier. This included paying attention to backgrounds, getting up close to subjects, and thinking of the composition of the photos. Towards the end of the day, the pupils began some work on portraiture. The pupils had an enjoyable day, and we are very grateful to Adrian for giving up his time for us. You can see some of the photos on the school website by clicking here. Comenius Evening – 7.30pm Monday 22nd June, in the multi-purpose hall. Our Comenius partners have reported a fantastic time here in Scotland in April. For our last Comenius evening, there will be displays from each of our partner countries, as well as refreshments. All are welcome so please come along! Important Dates – More details here on the school website. 18th June – Sports’ Day weather permitting!